Located in the heart of Florida, Lake Okeechobee offers a superb largemouth bass fishery. This is true bass country and trophy bass weighting in excess of 10lb are taken annually. The lake also supports a healthy population of bluegill, shell cracker and crappie. Bass fishing is excellent throughout the lake. The lake boasts endless miles of reeds. Casting spinner baits along reed edges and points is a proven tactic for catching aggressive largemouths. Flipping jig and pigs, plastic worms and lizards along the base of reeds or into pockets is also very productive. Fishing back into a reed bed in the heaviest cover can produce some hawgs. By far the best technique for monster bass is balloon fishing with large shiners. This technique involves using a small balloon tied to the line floating a large shiner about 1 ft of the bottom. The shiner is then cast near the reed beds, usually in open water along a reed point or edge. Big bass moving in and out of cover can't resist this easy meal. Patience is the key with this type of fishing but it can be very rewarding, with fish weighing 8-10 lb not uncommon. 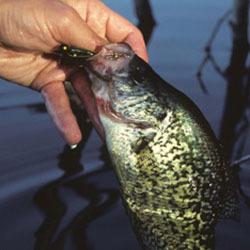 Crappie fishing on Lake Okeechobee can be fantastic, with large slab crappie in the 1-2 lb range caught annually. Minnows fished under floats around reed beds or pockets in submerged vegetation can produce heavy stringers of keeper crappie. Jigs fished the same way, can also be hot, with white, pink and smoke being the colours of choice. On dark days the whites and pinks are productive, whereas on sunny and clear days, smoke and natural colours produce consistent catches. Trophy bluegills also make Lake Okeechobee their home, with fish in excess of 1 lb taken annually. Bluegills will hold in the same areas as crappie, and it is no uncommon to catch both slab crappie and trophy bluegills on the same baits. The most productive bait for bluegills is small tubes, with pink, white and chartreuse being the most productive. Crickets suspended under a float can also be deadly, and account for some of the larger bluegills caught in Lake Okeechobee. Each detailed map provides depth, contours, structure, boat ramps, and updated fishing information. Lake Okeechobee fishing maps also include lake info such as gamefish abundance, forage base, water clarity, weedline depth, bottom composition, complete latitude/longitude grid lines and dozens of GPS waypoints & coordinates.